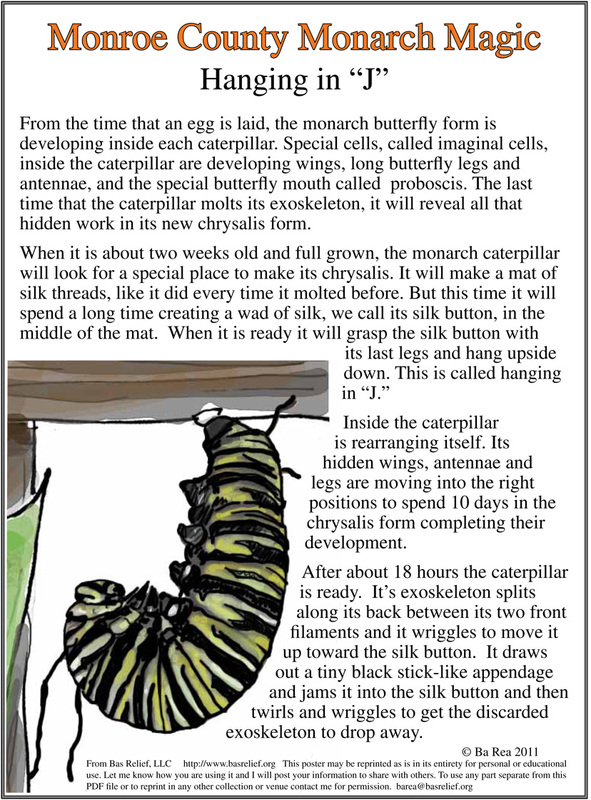 Monarch CATERPILLAR HANGING IN "J"
I am offering a series of posters and coloring pages as an introduction to monarchs in my community in Monroe County, West Virginia. Those posters will be available here for any teachers, monarch enthusiast or curious person to use. I ask only that you reproduce them intact with my copyright and contact information. To request permission to use the images or text in any other publication, printed or online, please contact me at barea@basrelief.org. If you use any of my materials in a classroom, at home or with a group and would like to share your experiences, I would love to post your photos, comments and suggestions. Please let me know: barea@basrelief.org This is the fourth of six posters, all of which can be accessed either through About Monarchs.